I'm forever fighting a losing battle with desk clutter. I cleared my desk surface about 4 days ago to prepare it for when these shelves are finished, and it's immediately back to a giant pile of junk. These shelves are intended to give me some more areas to store the junk and hopefully keep the surface of my desk clear, as well as give me somewhere to put all my electronics stuff. They're something i've wanted to build for a long while. I barely have the space to fuss with these full 8'x4' boards. Had to get help lifting the 18mm board onto the bench and crawl through that gap to get back out of the garage. I didn't bother video taping this project since I had enough of a job just wrestling with the boards. My tablesaw can only make cuts about 280mm wide, which was unfortunately too wide for most of the cuts required so I had to do them with a handheld circular saw. I'm going to try extending the tablesaw out a bit in the near future. Rough cut on a bandsaw and then sanded to the line with the spindle sander. Not the ideal tool really, the curve ended up ever so slightly wavy and i'm hoping edgebanding will smooth it out. I then cut the rest to size with the router table. First time using a flush cutting bit, and it did a great job. That's all the sides to size. Now all I need to do is drill holes for the dowels and apply the edge-banding. Unfortunately i've got no idea what the veneer on this plywood is, so I cant just order the edgebanding online. Might be a while till I can get to a place. Looks like you are off to a good start. Why not add drawers to the desk as well since you are at? Some interesting design details there. Looking forward to seeing how you get on with this. I've been considering adding a shelf/ drawer underneath to carry a midi keyboard on, but it's a fairly low desk and there's not enough space to also fit my legs. The solution might be some kind of drawer I could push really far back up against the wall, but then the desk's legs get in the way. 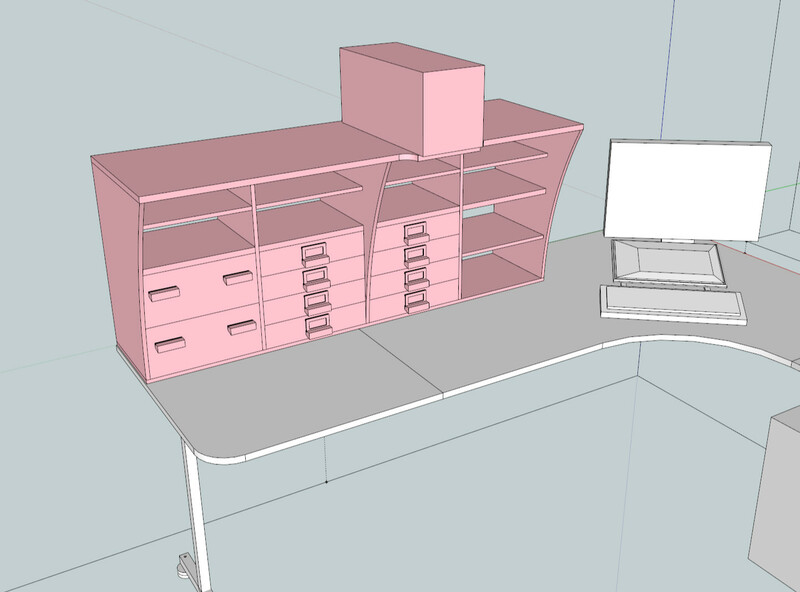 I should've said in the OP but the plan is to have it narrow at the bottom so it isn't ridiculously deep and taking up alot of the desk surface, but wide enough at the top to accommodate an oscilloscope. It'll be screwed to the bench to hopefully prevent it from tipping forwards. 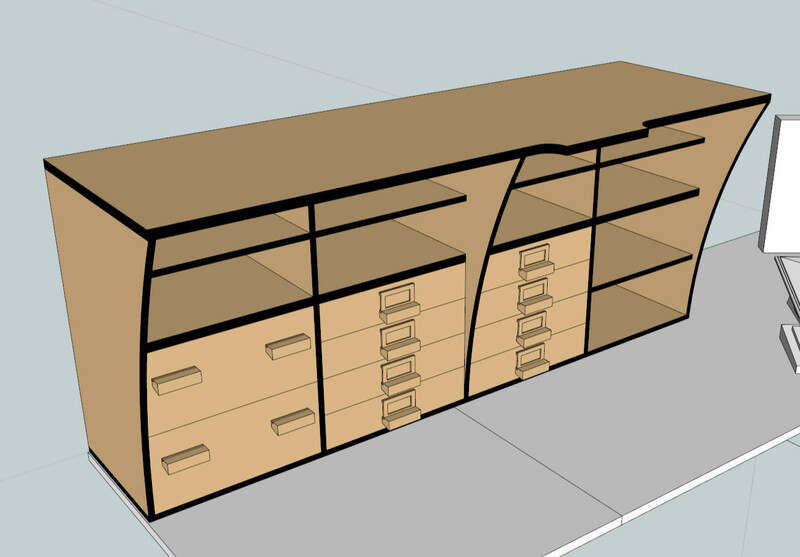 The curved sides support the top shelf from sagging (hopefully!). The scope I picked up at a boot sale was so long that I had to widen the design (i'd made the plans months ago), but even after doing that i'd forgot to accommodate the extra depth of the plug that fits into the back of the scope, but the top shelf was already getting ridiculously wide so there's a goofy little extension on the top shelf. You would be welcome at my place any time to add some organisation to the junk heap. Can you move the bottom drawers up to a higher level? Otherwise you will have to clear the desk to open the bottom drawers. That's something I hadn't considered. Although I had thought that if I put them up higher the top shelf would block access to them, or at least make it awkward. I might leave it as it is and just use the bottom drawers for stuff i'll probably never find a use for, like a stack of lenses from 3d glasses or a half dozen broken microfilters. Thanks for the suggestion though. Went along to a timber yard I haven't been to yet. Was quite a hike on the bus. They didn't have any edge banding in stock (i've yet to see any in person) but the guy identified the plywood veneer as eucalyptus and that seems about right. Unfortunately I can't find anywhere stocking it in the UK. I guess i'll keep looking but I might have to make my own, but that said i'm having a hard time finding eucalyptus at all. I don't really mind the look of bare plywood edges myself, but this WPB i'm using isn't the neatest of plywood on the inside. Simon, you should have said earlier - I felled a Eucalyptus tree last year. All cut to logs for the fire now. There's a whole grove of them a few miles up the road owned (or at least used to be) by the British Eucalyptus, where they used to collect the oil. Eucalyptus wood apparently burns very hot. Some stove manufacturers don't recommend burning it in their products. I remember when those Australian wildfires were on the news they made a point about the trees tending to explode from the sap boiling, which sends burning embers pretty far into the wind and helps the fires spread dangerously fast. First point, --- "burns too hot" --- don't know what illegal substances you've been digesting/ingesting/injecting, but where's the problem with that ? Second point, - it isn't the tree exploding that's the problem, it's the leaves full of volatile eucalyptus oil that explode into flames. The bushfires tends to run over the tops of the trees causing the leaves to explode into flame. These burning leaves are what gets spread about by the violent winds caused by the burning leaves. It's a self feeding phenomenon as it occurs. Basically, you don't EVER want to be anywhere near this, when it's happening. The burning tops can be up to half a mile ahead of the main blaze, which is into the standing timber, as the tops flash alight and start to burn, the embers are then dropped to the ground which then starts the main fire. Trees only explode when everything else has been burnt, so no problem at all when that happens. Ramin mouldings are available in most DIY stores varius sactions including flat , a close grained hard yellow wood that splits easily if nailed without drilling first , no idea as to price I have not bought any for years . Thank's for the suggestion but i've done stuff like that in the past and found it a real hassle to get the edges clamped. I'm really keen to give this iron-on edgebanding stuff a go too. I might try buying some black melamine edgebanding and see if I can pass it off as some sort of swish designer look. Coloured me model in, and it looks fairly okay to me. Simon, don't let me dissuade you, but I've never been very impressed with the iron on stuff - particularly on curved edges. Tends to lift at the slightest provocation. Yeah I hear alot of mixed stuff from people using iron on edgebanding. I'm also not so sure how i'm going to iron it down onto curved sections (maybe heat up a bit of bar with a blowtorch). But I feel i'll have to try it out myself to see how it goes, for better or worse. Waiting for the edgebanding to be delivered on Tuesday. Not much to do in the meantime but make this drill guide for dowels. The first attempt was off by a few millimeters, which was really surprising. Re-drilled the holes for the ferrules on the other side, this time with a fence on the drill press. It gave a better result, but it's still off by about maybe quarter a millimeter, but it's close enough for wood. I also measured and found out that the 12mm plywood was more about 11.2mm thick, so i'll have to adjust for that and the thickness of the edgebanding. I'm really not so good with wood, and i'm always impressed by people who can just slap furniture together in a few days like it was nothing. The trick with edgebanding is to remove the dust from the ply first , or to seal the end grain . Spent the last few days working on a secret project (its a banjo) that i'll probably make a video of. Makes it hard to get back to making the shelves though, but all the panels are taking up space that I need back. Tested the edge banding/ finishing today. Edge banding seems to hold on fine, I can't peel it off with just a fingernail and the flush parts I can't even get a nail into. Need to practice trimming it though. Really gouged up that first try. Surprised by how thin the stuff is. I also gave it a coat of automotive spray lacquer to try it out, and while it looks pretty nice (I can't tell the finished and unfinished side apart, aside from one not absorbing water) it's not very hard wearing so i'm not sure if i'll go with it yet. Hopefully should have this finished (minus drawers) in a few days. Here's more thrilling progress. Got the boards all edgebanded and ready to assemble. Took a surprising amount of time to do. Although I might finish the boards first while I can still get at them. I'm stalling having to drill the dowel holes since i'm nervous about misplacing them. Half a millimeter misalignment can look pretty lousy if it's where boards meet. Although before anything I'll need to tidy up. Have you thought about making a dowelling jig? There's lots of types on ebay but the ones I have are simply an L shaped block with holes in. The shape of the block allows you to clamp it to the edge and drill through to locate the holes the same distance from the edge in different bits of wood. You're quite right. How could I miss that.